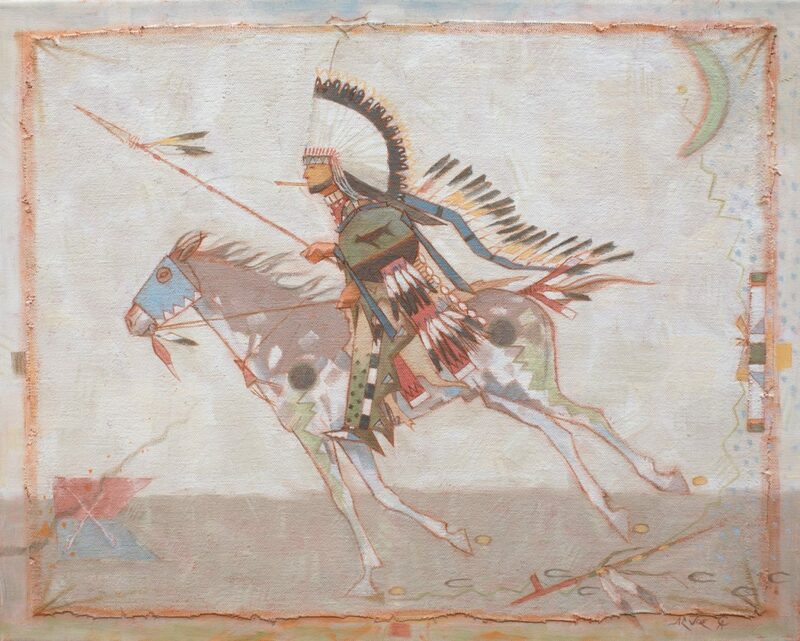 The painting shows a warrior wearing a warbonnet dressed in full regalia. This would be a young man by the name of Howling Wolf. The glyph with a line and wolf drawn at its end shows his name. The shield also bears a wolf running. With a lance in his hand he races to count coup and possibly make a kill. The warhorse’s chest bears the power of an eclipse, the black Sun. To the right side of the painting. There are signs and symbols of the warriors power. The yellow dot from the green moon is translating the power of the star to the War pipe below. The Cheyenne believed in the mystical beings of the sky and universe. All four colors of the sacred directional songs are represented by dabs of yellow, red, black and white. The warpipe had to be offered to several bands, those that smoked joined the parties in the attack(s). To the lower left, The symbol of a company flag in a fire at Fort Wallace. embers and smoke rise in the the flat plains along the Smokey Hill River.